One of the interesting byproducts of the old studio system was that if an actor/director pairing had a hit, they could just keep making the same film over and over again. You could level the same broad criticism against current films - especially if you’re sick of superhero movies - but back in the 1950s, Blu-ray and streaming didn’t exist, so there was a plausible - and financially sound - reason for releasing extremely similar titles pairing proven acting and directing talent. Modern audiences still remember Jimmy Stewart for holiday melodramas like It’s a Wonderful Life and The Shop Around the Corner, as well as Hitchcock films like Rear Window and Vertigo, but many would be surprised to know that Stewart made roughly two dozen westerns over the course of his lengthy career. Between 1950 and 1955, he made five of them with director Anthony Mann, the second of which was Bend of the River. Several recurring factors unite the Mann/Stewart western oeuvre; stunning Technicolor landscapes, casting the all-American Stewart as a host of remorseful killers, and building the narratives around morally ambiguous scenarios that presaged the rise of the Revisionist Western in the 1960s. Bend of the River stars Stewart as Glyn McLyntock, a former border raider leading a group of settlers into the Columbia River Valley in 1866. McLyntock’s backstory as one of Quantrill’s raiders - a pro-Confederate domestic terror group operating in Missouri and Kansas during the Civil War - is an origin shared by numerous outlaws both real (Jesse James) and fictional (Josey Wales). McLyntock is referred to only as a “Missouri border raider”, which somewhat soft-pedals the severity of the crimes he would have committed as a member of Quantrill’s raiders. 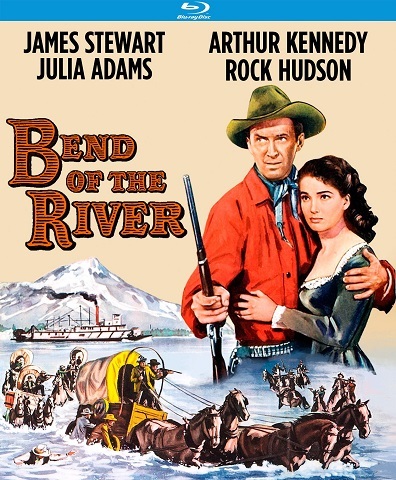 Bend of the River was Stewart’s return to the western genre following Broken Arrow in 1950. That film was notable in its overt - if dated -attempt to portray Native Americans in a positive light in response to decades of blatant stereotyping. Bend of the River is retrograde by comparison, with an attack early in the film depicting the Shoshone as faceless barbarians. The film also features a performance by African-American character actor Lincoln Theodore Perry, who was billed in dozens of films as Stepin Fetchit. To his credit, Mann doesn’t linger on or relish these cringe-worthy elements, instead focusing on the difficult logistics of frontier life and the relationship between the repentant McLyntock and Emerson Cole, another former raider played by Arthur Kennedy. Kennedy is little remembered by modern audiences - despite accruing five Oscar nominations between 1949 and 1958 - but his early-Method naturalism and good-natured sneer is an excellent foil to Stewart’s weary decency. Kennedy’s avuncular treachery here recalls a young Kiefer Sutherland while Stewart’s performance feels like an ancestor of Tom Hanks’ in Saving Private Ryan. Despite a colorful cast of supporting characters - including a young Rock Hudson as a dashing gambler - the film’s spine is built around the relationship between Stewart and Kennedy as two men hiding their past, one out of genuine regret and the other out of callow self-preservation. Their dynamic is morally clear cut, but still more nuanced than the typical white hat/black hat dynamic of classic westerns, with a sharp script from Borden Chase, writer of Red River and Winchester ’73. Even more so than Stewart or Kennedy, the true star of Bend of the River is the Pacific Northwest landscape, rendered in gorgeous Technicolor and benefiting handsomely from Kino Lorber’s 4K transfer. Shot on location in northwestern Oregon during an era when most westerns were filmed on desert ranches on the outskirts of Los Angeles, the film envision the Columbia River Valley as a picturesque paradise with verdant green forests, snowy mountain peaks and crisp, chilly rivers. From the perspective of 2019, such untouched natural splendor feels even more remote and historical than it would have in 1952 when the film was shot.